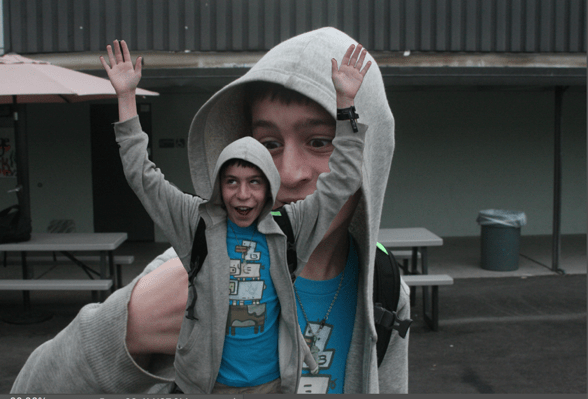 Goal: Combine two images so that someone is holding a smaller version of him/herself. Take two pictures of your subject. One picture should be fairly close up and show the subjects hand. Have the subject partially close their hand, as if they are holding something. This will be the main picture. Notice that he’s looking slightly above his hand, as if there’s something there. Have your subject do the same thing. The second picture should be a wider shot. Remember how you took the first picture, and pose the subject for the second shot in a way that will fit in with the first image. I made a mistake when I took this picture. I should have looked for a solid background. Because the background has many colors and shapes, it will be harder to automatically remove. 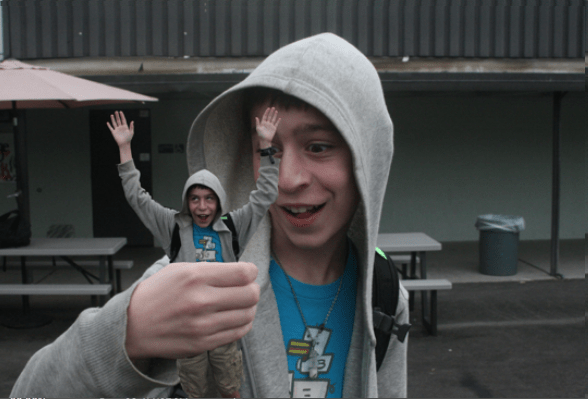 Save the big picture as a Photoshop file named your name big me little me.psd . Copy the smaller image onto the larger one. The easiest way (though not the only one) is to switch to the move tool (the first tool on the toolbar) and drag the background layer of the smaller subject onto the larger one. It will probably be the wrong size. Rename the layer little me. 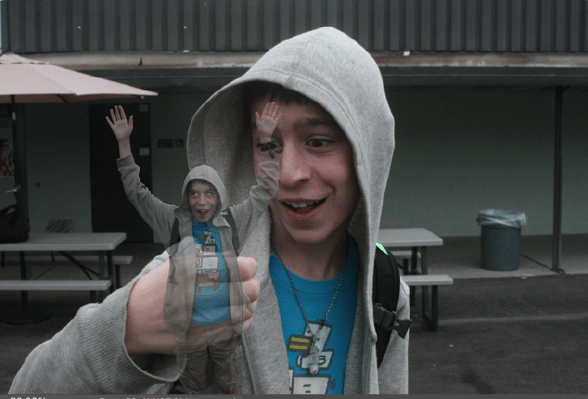 Set the opacity of little me to a level that lets you see both images at once. 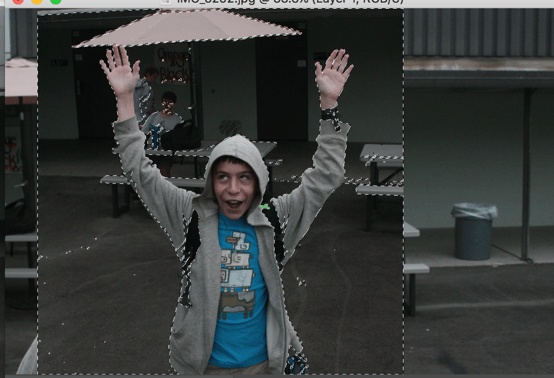 Reset the little me layer to 100% opacity. Use the polygonal lasso tool to clean up your selection. Remember: if you hold down shift or option to add to or subtract from your selection, only hold it down for the first click! When you’ve completely isolated your subject, hold down option and select the mask button (at the bottom of the layers list- it looks like a circle inside a rectangle). 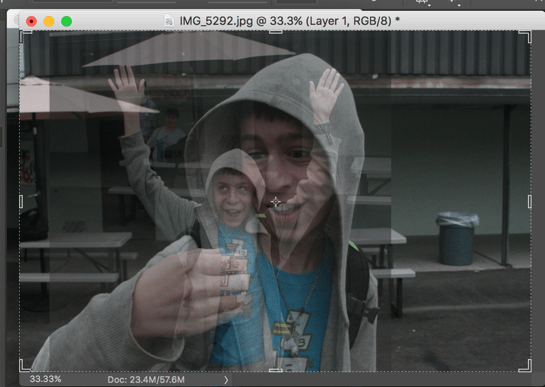 Lower the opacity of the little me layer so you can see both layers. 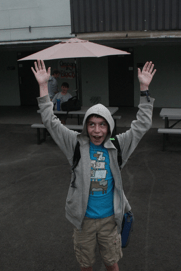 Use the transform tool to adjust the position of the little person to fit in the big hand. Make sure you are on the mask for the layer. Use the lasso tool to select the parts of the smaller body that will be hidden by the hand, and fill those sections of the mask with black to hide them. You will probably want to zoom in on the hand to make this easier. 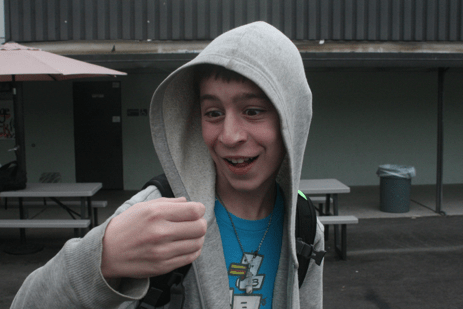 Reset the opacity of the little me layer to 100%.